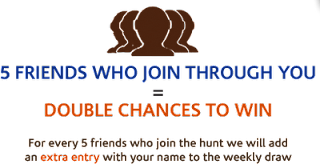 Money Ham: WIN MashreqMillionaire Certificates worth AED 1,000 each, every week! WIN MashreqMillionaire Certificates worth AED 1,000 each, every week! After Visa Olympic Contest Mahreq Bank UAE is bringing another exciting game just for you. Do you have it in you to be the modern Indiana Jones? 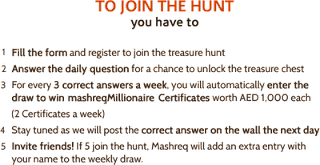 Check NEW MashreqMillionaireTreasure Hunt & WIN one of the 2 weekly mashreqMillionaire Certificates worth AED 1,000 each, every week!